Normally, I would keep my distance from a perfume house like XerJoff. I mean, why break my heart? Even XerJoff's refill bottles start at $270 for 50 ml, and let's not even get started on the cost of the quartz or Murano bottles. At these prices, Amouage begins to look like a bargain. But fate intervened when XerJoff asked me to help write copy for their new brochure. Not only did I get to sample all of the XerJoff fragrances, I was paid in perfume. Two bottles of it. I chose Irisss and one of the new releases, Richwood. Over the years, I've learned that things that are truly beautiful evoke a physical response. Who hasn't hovered on the brink of tears at a moving piece of music or gasped at a turn in the road revealing a breathtaking sweep of scenery? Even the mundane can be beautiful that way: Just last night I had a bite of roast lamb with truffled leeks and parsnips that made my heart beat faster. For me, both Irisss and Richwood elicited the sharp, physical thrill of beauty when I first smelled them. Jacques Flori, the nose behind Etro Messe de Minuit, Etro Shaal Nur, and Amouage Opus IV, composed Irisss Eau de Parfum. Its notes include Florentine iris butter, carrot seed, rose, jasmine, ylang ylang absolute, violet leaves, vetiver, and cedarwood. To me, Irisss is a Monte Carlo showstopper of an iris — almost bigger and more lush than real life. In short, Irisss is to iris as Guerlain Nahéma is to rose. 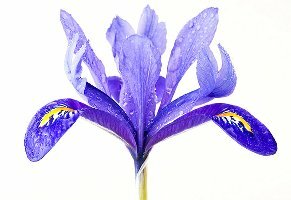 Just as in Serge Lutens Iris Silver Mist, Irisss shows the earthy, root vegetable aspects of iris, but Irisss balances its rootiness with a tingling whisper of jasmine. It is less minty than Iris Silver Mist and builds on the refined, velvety side of iris butter. That said, it isn't as sweet or smoothly driftwood-inflected as Van Cleef & Arpels Bois d'Iris, nor is it as powdery as Frédéric Malle Iris Poudre. Irisss is thick and palpable, not the thin iris of Prada Infusion d'Iris or Hermès Hiris that can on a bad day remind me of dirty hair. Irisss's genius is that it takes iris butter to the extreme, luxurious edge without coming off as a parody of iris. To get an idea of the tightrope Irisss walks, imagine almost psychedelic visions of 1930s Hollywood — Jean Harlow in bias-cut silk charmeuse drowning in diamonds and yacht parties crowded with iced Champagne and cold pheasant under glass. Think of Edith Head's designs for a pre-code movie about Louis XVI with an unlimited budget. Still, Irisss being all about iris, intelligence and elegance underlie this hedonism. When Irisss's jasmine fades, a hint of powder appears, but it is as fine grained as air. Irisss has moderate sillage and lasts a day at work and longer. Richwood Eau de Parfum is another of Jacques Flori's compositions. Its notes include Mysore sandalwood, citrus, cassis, rose, and patchouli. In some ways, Richwood reflects the sensibility of many of the XerJoff fragrances more than Irisss does. It shares the high quality of Irisss's ingredients, but is warmer and inflected with amber. Although I might love Irisss just a shade more than Richwood, it is Richwood I get the most compliments on. To me, Richwood smells like the depths of a winery, underground where the barrels of fruity, deep red wine age. Except, for Richwood the barrels are made of sandalwood — real, sweet sandalwood — not oak. I smell earth and wood stained with port-like, red fruit. Rose lightens the fragrance and keeps it from getting too thick. Still, if you didn't make a point of thinking of the rose, you might not notice it. As Richwood wears, amber begins to warm its wood. Richwood has terrific lasting power. A spritz before breakfast will last you well into dinner. If you get some on your sweater, you'll smell it (lucky you) into the next day. All in all, none of XerJoff's fragrances smell wildly revolutionary. XerJoff isn't going to supplant Comme des Garçons or Etat Libre d'Orange for creative perfume. But have you ever examined an expensive, Italian-made sweater? At first glance, it looks like any other, say, long-sleeved, V-necked sweater. Look more closely, and you see it's subtly shaped to broaden the shoulders and hug the waist. Touch its fabric, and you touch strength, resilience, and a softness that compels you to brush it against your cheek. This sweater is the perfect nexus of craft, quality, and design. Suddenly you understand how a simple sweater could be worth $600. That's how I think of XerJoff Irisss and Richwood. XerJoff Irisss is available in 100 ml Eau de Parfum, $715. It can also be found in handmade 20 (550€), 30 (400€) or 50 ($1788) ml Murano glass bottles in a variety of colors, or in a 50 ml refill ($270), or in a Rutilated Quartz bottle (special order, 12,000€). The image just above shows the 20 (at right) and 50 (at left) ml Murano bottles, not true to relative size. I assume Richwood is in similar sizes/options, but will update when I know for sure. For information on where to buy, see XerJoff under Perfume Houses. Note: top image is It's a bird!!! by bensonkua at flickr; some rights reserved. Oops: there are several bottles in the Quartz series besides the Rutilated Quartz, including Rose, Lemon or Smoky Quartz (8498€) among others, and all of those come with 15 ml Perfume Attar. I bet the copy you wrote is fabulous! I just got paid for a job in beer–unfortunately I neglected to sample it before I accepted the offer. Let this be a lesson–never buy unsniffed or untasted. That’s funny! (Or not so funny if the beer is really awful.) Yes, you have a good point: cash in hand is better than unsniffed or untasted. at least have the decency to look a little guilty…. Hey, you’re getting as good as you give! Speaking of giving, I just got your package. Thank you! I’m testing Portrait of a Lady right now on the back of my hand (the rest of my arms are busy with Richwood.) I’ll put a little something in the mail for you, including samples of Irisss and Richwood. You’re the BEST!!! just a dab, and I’ll be eternally grateful….unless of course I love one (or , egad, both!) –then I’ll have to mumble all sorts of uncomplimentary things about “reckless enabling” while I sign over my life savings to parfumsraffy…..
I’ll set you up, no problem. And as you say, maybe you’ll detest them! Don’t worry, Empress, we’ll be right there with you, showing our support, buying decants. it’s good to know I won’t be living in that cardboard box down by the river all alone! PoaL? Daisy sent you PoaL??? Excuse me, ahem, Miss Daisy…. Oh, I bought a decant of it from her! Of course the package was generously larded with other wonderful Daisy things. yes Opera? (flipping madly thru my notes…) was I supposed to send you some? If I’ve forgotten you–drop me an email….I’ve been half out of my mind lately…. LoL! Not quite, dear Queen-D. I didn’t know about the split, but then, I’m not a regular split subscriber anyway. I can just as well order a sample, so it’s okay. opera—don’t order a sample! I have a couple things to send you anyhow….so I’ll just add PoaL —however I probably won’t get to the PO until next week. I’m almost relieved that the 50ml refill of Irisss (for a paltry $270) is sold out….next quarter I’m going to have to sample these (even though the mere thought scares me a little) …. I’ve sampled several from the earlier offerings and didn’t really care for any of them…wouldn’t it be lucky if I didn’t like these either?? It was a treat to get really special perfume! You’re right, I would have otherwise told myself no, the money needs to go to saving up for a new furnace or something like that. If you organize a split of the $270 bottle, count me in for 5ml! well, that sort of attitude isn’t going to help me resist !! however, I have made a note…. Daisy, I love that you checked on the refills during the midst of these comments – and please put me on that list, too! will do….what would that make it….grabbing handy calculator….$5.40 per ml…..golly….okay, I guess as self-respecting perfume hos we have to look into , yes? count me in too Daisy….cardboard shacks are quite warm…. I read this with interest, as Shaal Nur is a favorite fragrance of mine, and have wondered about its creator. The Richwood sounds especially appealing to me! Oh, and I had to laugh at your comment about the thin iris of Hiris sometimes reminding you of dirty hair. I think I actually “get” this, LOL! Iris is so fickle, honestly. I like the turnip-like aspects of it, but it can go dirty hair, too, I think. I’ll have to re-sniff Hiris and re-think that one. I always equate costus with unwashed hair. Not that I don’t like it. I have some Nina Ricca Fille d’Eve that has that odd, costus, sebum-like, unwashed hair vibe going on. And it’s a great scent. Is there a distinction between unwashed hair(costus) and dirty hair (thin iris) I wonder? (Or maybe I’m just splitting hairs. Groan.) Anyway, congrats on scoring these! I think I have to save up some money and join or start a split. Fille d’Eve! Fabulous score, that one. I’ll have to dig out my sample of Hiris, then try it next to something costus-laden. Of course, ideally I’d also have someone around with dirty hair. …..but now I have to get out my Hiris & Prada IdI and see if I detect a dirty hair note (which will utterly ruin them for me.) The funniest thing is that I usually mix Hiris and Id’I in an atomizer to make a nice iris blend….double-dirty-hair….uh-oh. Hey, maybe they cancel each other out. Shaal Nur has really grown on me this fall too. It is fantastic stuff. I’ve had to pace myself so as not to blow through my decant. It is definitely FBW. Now I’ll look at sampling the other fragrances from Jacques Flori too. It’s so nice to see a resurgence in Shaal Nur’s popularity! Ann and Angela, if I had to pick a signature fragrance (which of course I am NOT going to do, ha ha), it would be Shaal Nur. It is versatile and pretty, and I am supremely comfortable in it! I should be wrapping presents and instead took a break to visit here. So glad I did. Sort of. Now have this strong yearning to try Richwood as it sounds fabulous. Maybe Daisy will hate her sample and look to pass it on. **WAVING TO DAISY** Yoo-hoo, over here, Daisy!! Lucky you for getting to try these and lucky XerJoff for having you write for them. Finally, someone will have decent copy! And now that you’ve worked with them, how DO they pronounce XerJoff?! I don’t know how to say XerJoff, since all my dealings have been by email! I’ve been saying it like “ZER-zhoff”, though. Richwood is a good one for this time of year. I’m wearing it today, in fact. Good luck with all the wrapping! LOL–I’ll keep that in mind….I’m scared I might like it!! Aren’t some of the best things in life those which throw you back into your body in an ecstatic way? I love the feeling of ecstasy through immersion. I guess I’ve outed myself as a hedonist. Irisss sounds awesome. If only bottle of that and Iris Silver Mist would just appear! I used to work at a vintage clothing store, and I could really see when a customer had a true love connection with a dress. She would look at lots of things and talk about how lovely they were, then hit upon a certain dress and nearly shriek with appreciation. You could practically see her heart beat faster. That is funny! I need to watch how I express my responses when trying things on…LOL! Definitely. If you find yourself dancing in front of the mirror, then you’d better get ready to buy! And then “I Feel Pretty” from West Side Story comes on magically. Wow, a true example of “nice work if you can get it”! What fun to write perfume copy at all, much less for such an elegant house. These both sound wonderful (even though iris it a tough one for me). Your descriptions can certainly be hard on my wallet sometimes, but now is not the time to chase these down. I like your example of the Italian sweater – sometimes you do come across something that lets you know why it’s expensive. Geez, ramble much? Not rambling at all! It was a great opportunity to help with the copy, and I can’t complain at all about the payment, that’s for sure. It was fun to be able to try them all, and these two really stood out for me. Angela, not only did your description of these have me reading this review on the edge on my seat, I just about died when I saw those bottles. The only word that comes to mind is ‘stunning’. Can’t say that I’ve ever been a fan of iris-based scents (usually too powdery for my liking), I certainly am curious to sniff this one. And the Richwood sounds lovely as well. There is definitely a touch of powder in Irisss, but not anything close to Iris Poudre, I think. 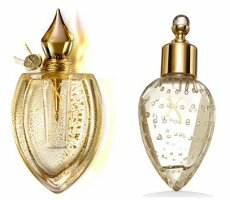 The bottles really are something else–more likely jewelry than mere fragrance containers. If it helps, neither of these smells anything like Shaal Nur or Messe de Minuit! Still, I think they’re worth sampling. Oh, no, I didn’t think that they did. But those fragrances are so well done, it’s hard to imagine the same perfumer making something not even worth smelling, you know? I totally know what you mean. Certain perfumers are so alluring to me. I want to smell everything Yann Vasnier has done, for instance. Angela – I’m going to pretend like I didn’t hear/read anything you said above. They do sound amazing – esp. the Richwood. Perhaps a small sample is in order, but then I don’t want to risk a broken heart/broken wallet. It gives me relief to know that fantastic perfumes are still being made out in the world. I know what you mean! Normally I would have resisted, too, because of the cost. These fragrances are made for people with Rolls Royces in the garage, I think. I, too, am happy to know someone hires good perfumers to use really nice materials to make perfume without all the focus-grouping. How on earth can I justify buying a $15 1ml sample? That Irisss sounds so wonderful. And looking at the evil XerJoff website, the Xerjoff Elle sounds beautiful too….eeeek! My poor budget!! Yikes! That’s a hefty price for a sample! Oh my goodness. I really want to try the Irisssssssss now. That just may be possssible…. Angela-Love those bottles! And you were paid in perfume? I certainly wouldn’t mind that a bit. Oh yes-I’ve been meaning to tell you. I checked out the local Salvation Army that I didn’t know was there( they had moved after the new phone book came out) and lo and behold, nabbed a vintage Lauren gift set circa. (according to the box) 1985(but I’m betting 1984) with the lotion beyond recognition, but the perfume was 3/4 full as the powder and soap. Still smells like it did. I so agree with The Guide’s comment on how it was not what it used to be because I went to Macy’s and smelled their stock. So not the same. Also came across some vintage Magie Noire. Since it was the first time smelling it, I have nothing to compare it to. Was it always so loud? Re vintage Magie Noir: Heck, yes (but in a good way). What terrific finds! Nice work. Magie Noir is a big fragrance, but big and beautiful, I think. Dolly2, if you find you don’t like loud, there are many here who would love to adopt your loud foundling! Sorry,I passed on the Magie Noir, but I am going back this Thursday. If I decide to cave, I’ll will let you know. I know! But if you ever stumble across a tester, be sure to try it. Especially this time of the year….. Especially since I love many of the same things you do…. I know exactly how it feels, unfortunately, to be tempted by something so expensive. If you ever get the chance to smell them, though, be sure you do. Not to be picky, but isn’t there a conflict of interest going on here? How so, when she fully disclosed her business dealings? She was paid to write their copy, not to give them any type of review, and she gave a full “buyer beware”. I don’t think so, but I appreciate your bringing it up. First, I didn’t have to review these fragrances. Second, lots of people get perfume for free and then review it. I had to work for mine! Third, I’m sure not hiding anything. It’s nice to review perfume that I really like. After writing reviews for four and a half years, I’m not wowed by perfume as much anymore as I used to be. if anybody deserves this, it is you Angela! Enjoy, enjoy and enjoy. I’m sorry to hear about your friend! I’m sure you’re bringing her/him a lot of comfort. Angela, I am wondering how would you compare Irisss to L’AP Iris Pallida and the recreation of Iris Gris by Legendary Fragrances? It has been so long since I’ve smelled Iris Pallida, I can’t comment on that one, and I’ve never smelled the Iris Gris remake (what do you think of it, by the way?). The LF Iris Gris is very plush and beautiful – I bought a bottle and really enjoy it. I never had any of the original Iris Gris and cannot really say how exactly it replicates the original. I did smell the Osmotheque version on a scent strip only, and it seemed a bit more tailored, perhaps, but scent strips are different. By the way, one of the amusing things that LT told us was that the nose who created the original Iris Gris knocked it off in an afternoon – he was famously lazy! Amazing. i smelled real Iris Gris once, thanks to Denyse of Grain de Musc, and I only remember a sensation of iris, peach, elegance, and cigarette smoke. It was wonderful. You make me want to smell the remake. Great story about the perfumer, too! Angela, out of curiosity, how would you compare Irisss to Delrae Mythique? Oh, they are really different. To me, Mythique is fresh and delicate, but Irisss is lush and wet. If Mythique were a chiffon slip, Irisss would be a heavy silk gown. Irisss smells more iris-y than Mythique, and doesn’t have any of Mythique’s suede. Plus, Irisss has a definite layer of buzzy jasmine Mythique doesn’t have. Wow, Angela. How nice to be paid in perfume… and such luxurious perfume at that! The three Xerjoffs I tried (Oesel, Lua, Modoc) didn’t wow me, though Modoc was very nice and struck me as a more luxurious, very intense version of CdG Wonderwood. At those prices, I’m not really chasing down samples of this line either, but you’ve made both of these sound SO nice. Any beautiful take on iris definitely makes my heart beat faster. Of the three you tried, Lua was definitely my least favorite. I liked Homme (a terrific, unadorned leather), Uden, Dhofar, and Kobe better. Oesel is really interesting to me in its pollen-thick mimosa. Have a terrific holiday, too!